borough, most would be hard pressed to correctly identify the actual site of Middleborough’s Training Green from which the neighborhood takes its name. Unknown to many is the fact that there were actually two greens at the area now known as the Green and the site most frequently identified as Middleborough’s training green was never used for such a purpose. The Training Green today, in fact, largely lies buried under a layer of asphalt. On September 1, 1640, the Plymouth Colony court passed a law “that the inhabitants of every town within the government fit and able to bear arms be trained (at least) six times in the year.” Middleborough (once incorporated) seems to have been somewhat lax regarding the immediate implementation of this law, and along with the town of Swansea, was castigated for its lack of efforts by the Plymouth Court: “This Court doth order that Swansea and Middleborough shall chose some for officers to lead their military companies and Instruct them in martial discipline.” A chastened Middleborough, only a small town demographically at the time, mustered what it could and placed an ensign at the head of its company. While some type of military training subsequently may have been provided to this company, its numbers remained few and perhaps not coincidentally, Middleborough along with Swansea, both of which had been sluggish in adopting defensive measures prior to 1675, were burned to the ground at the start of King Philip’s War. Two acres of land be it more or less, being part of my fifty acre lot, lying near ye meeting house in Middleboro aforesaid, which said two acres of land lyeth at ye south corner of said lot, and is bounded at ye southwest end thereof by ye range between my said lot and ye lot of William Ring and on ye southwest side thereof. It is bounded from ye south corner bound of my said lot being a red oak tree marked on ye northwest side of Plymouth Road [Plymouth Street] by ye Pound, five pole and a half by said road unto a stone set in ye ground by ye side of ye road, and from thence north nine degrees easterly six pole and a quarter to a stump with a stone about it, about a pole and a half to ye westward of Ephraim Woods dwelling house, and from thence North 55 degrees easterly, eighteen pole and a quarter to a white oak saplin [sic] marked with stones about it, and from thence, northwest, three degrees northerly sixteen pole to a small white oak marked with stones about it by ye east side of ye road that leads to Bridgewater [Plympton Street], and from thence, the northwest side thereof is bounded by said road unto the first mentioned range between my said lot and ye lot of William Ring. For fifty-eight years, Middleborough had but one militray company. The town was later divided into four military districts, each headed by a captain and two lieutenants. These four Middleborough companies formed a battalion headed by a major. house was constructed just 150 yards east of the site of the present Church of the Green, the area in front of it was also set aside as a green or public space. To distinguish it from the earlier Training Green, this new area became known as the Upper Green while the older training field would become known as the Lower Green. It is this area situated in front of the present church which many mistakenly believe to be the town’s original training ground. While the Upper Green appears to have witnessed little community activity, the Lower or Training Green remained the center of Middleborough’s social life. Along its perimeter stood the Sproat Tavern, as well as the second building to house the First Church of Middleborough. At least one house also stood on the edge of the Training Green on the present site of the church parsonage. The week before last our Sons of Lyberty put up a lyberty Pole on the Green. Our Minister grac'd the solemnity with his presence, and made a prayer under the Pole, and an harangue upon Lyberty. It was a day set apart for the Officers of the Company to resign their offices. Mr. Conant took the pikes, and gave them to the new Officers; he has rendered himself very ridiculous to many of his friends. With time, however, the Lower Green gradually fell into disuse for military training purposes. And as travelers are wont to do, they began taking the easiest and most direct route from point to point which frequently meant directly across the muddy green rather than around its edge. While the original pattern of roadways ran around the green, in time, a large portion of the green became criss-crossed by what are now Plymouth, Plympton, East Main and Wood Streets, and the southern strip of the training field ultimately incorporated into the adjoining properties. This process of decline was hastened during the 1800s by removal of the center of town to the present Four Corners. By the early twentieth century, when Route 44 passed down East Main Street to the Green, motorists were much inconvenienced by the tangled intersection of roads at the Green and petitioned the Plymouth County Commissioners to do something about it. The Commissioners in fact suggested a small rotary which fortunately was never built as it would have greatly compromised the appearance and character of the immediate neighborhood. Shortly, thereafter, in 1941, the Town of Middleborough acquired legal title to what remained of the former Training Green through a convoluted legal action which saw the town bring suit against Middleborough's military company which had been defunct for generations, claiming that “Ye Military Company” had not paid its 1938 real estate taxes of $35.40. The land was taken by the town and ultimately transferred to the Cemetery at the Green. Since that time, the Green has changed little. Traffic still passes over a large portion of the western end of the former Training Green, while the installation of curbing has helped, somewhat, to define small historic islands of land which were once an integral part of Middleborough’s Training Green. 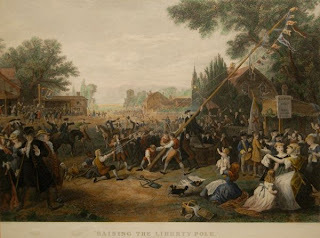 "Raising the Liberty Pole", Frederic A. Chapman, engraving, 1875. 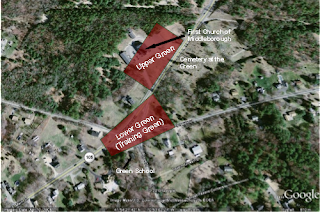 Map showing the approximate location of the Lower and Upper Greens at Middleborough, MA, created by Michael J. Maddigan using Google Earth. The map shows only the approximate vicinity of the Lower (Training) and Upper Greens at Middleborough and not the actual boundaries. While the boundaries of the Lower Green are able to be known through historical records, those of the Upper Green are less well documented. Oliver, Peter quoted in Marian and Warren Whipple, "Middleborough in the American Revolution", The Middleborough Antiquarian, 26:2, May, 1988. Stetson, George Ward, "The Old Training Green", The Middleborough Antiquarian, 15:3, April 1974.